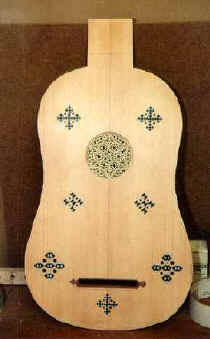 The first form of the vihuela was represented by an instrument with sometimes many soundholes or decorations. Original from 16th century, the vihuela was, in its final form, a guitar with six double strings made of gut. The large type of vihuela was some four inches longer than the modern guitar. The neck had twelve frets. 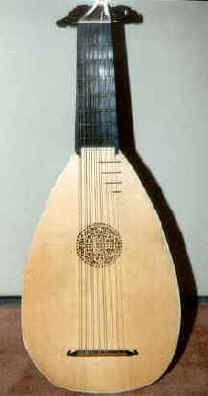 In its popular form, the lute had a variable number of strings, eight double strings in this figure. All of its four strings were double in most of Europe with the exception of Italy, where the first string remained single, and the tuning of the Italian instrument differed from the standard system. The five-string guitar shows 10 frets made of gut. The strings are 68 cm long. The chitarra battente came from Italia and had double metal strings. The frets were in gut and the sound hole is highly decorated. The neck is covered with mother-of-pearl. The back and sides of that guitar are decorated, in ebony and ivory. It is characterized by a soundbox the back of which curves gently outwards instead of being simply flat. The guitar of the right was made by René Voboam, Paris. It is dated 1641. The left guitar is made by Domenico Sellas, Venice, ca 1670. Inlaid mother-of-pearl. It is a very few decorated guitar: a contrast with other guitars of the same time. It dates back to either 1680, or 1688. Fretboard in ebony, lenght of strings: 74 cm. The back, as for Stradivarius violins, is made of maple. The joints are inlaid with ebony. Guitar made in Paris by Salomon around 1760. Note the presence of two additional tuning pegs at the middle of the head. Frets are made of gut. Instrument made in Cadix in 1804 by Pagé. There are twelve frets in metal followed by shorter frets on the soundboard. A fanbracing system is used. Guitar made in Lisbon, Portugal. It is undated. The head and neck are very decorated. He devised a larger soundboard fitted with wider sides, and he invented the use of fanbracing under the soundboard to enrich the sound. Top of the soundboard made od fir, bottom and sides of soundboard made of rosewood, maple or cypress. Neck made of cedar covered of rosewood fretboard. Történelem Illusztrált Változata Klassikus Gitár: Hungarian translation of images of ancient guitars by Szabolcs Csintalan. Spis rysunków: Polish translation of images of ancient guitars by Anna Chekovsky. Klasičnu gitaru Illustrated History: Bosnian translation of images of ancient guitars by Petra Vlasic. Класична гитара Историја: Macedonian translation of images of ancient guitars by Petra Vlasic. Класічная гітара ілюстраваная Гісторыя - вобразы старадаўніх гітар: Belarusian translation of images of ancient guitars by Sergey Ivanov. ChameleonJohn.com: Indonesian translation of images of ancient guitars by Jordan Silaen.